Could you tell us three reasons you’re awesome? 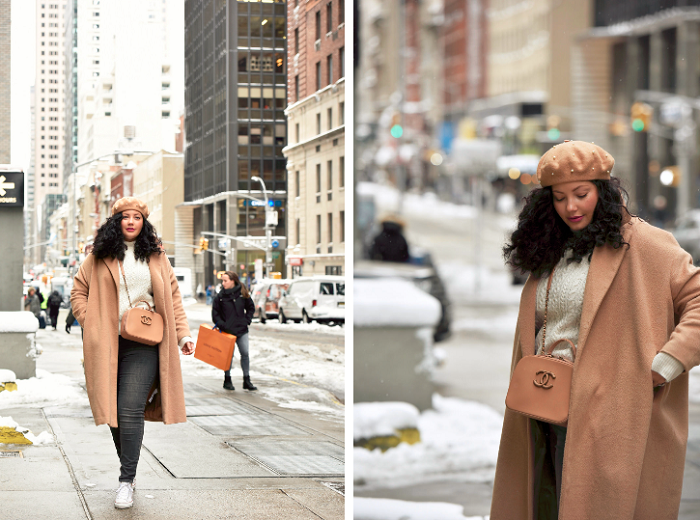 My mission is to help women build a healthy relationship with fashion and getting dresses, I support fashion designers making clothing in extended sizes, and I made it to Fashion Week with six months of starting my blog. A yellow/mustard colored blazer from Zara on 5th Ave. in NYC. I remember when my mom let me pick out my own outfit or the first day of pre-school: a baby pink Levi’s jacket and white flare Levi’s jeans, black mary-janes. I cried when my pants got dirty on the playground! A vintage Louis Vuitton bag for $37.99, which I turned into a clutch due to a broken handle. High-waisted, wide leg black slacks, an olive green and black, sheer, polka dot top with a bow, an over-sized Michael Kors rose gold watch, an onyx stone cocktail ring, leather and gold statement necklace, and black pumps with lace applique. 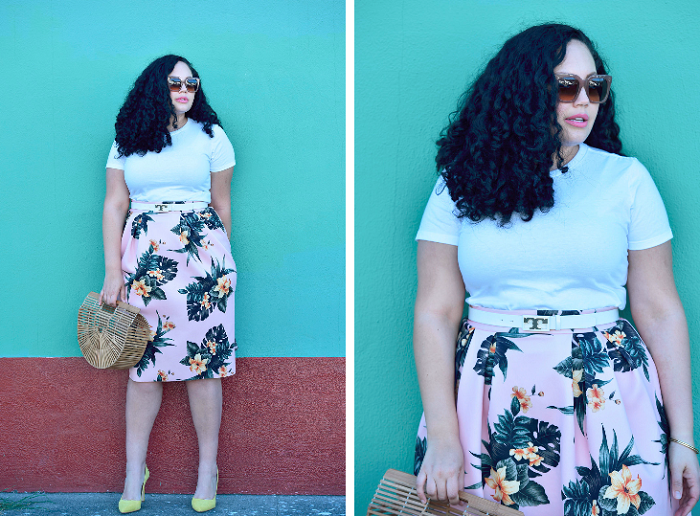 Cropped slacks! It’s so hard for me to find a great fitting pair, due to my height (I’m 5’10”) and my body-type (hour-glass/pear). 1. When you can’t find anything to wear, wear what you feel most like yourself in. 2. When you need to add some va-va-voom to your outfit, add a waist-belt to show-off that waist to hip ratio! 3. Don’t be afraid to try skinny jeans! Paired with a blousey top and open front cardigan, they can be super flattering. Thanks so much, Tanesha! Do you guys have any questions for the lovely lady? Love her! Curves are the sexyist thing a gal can own. 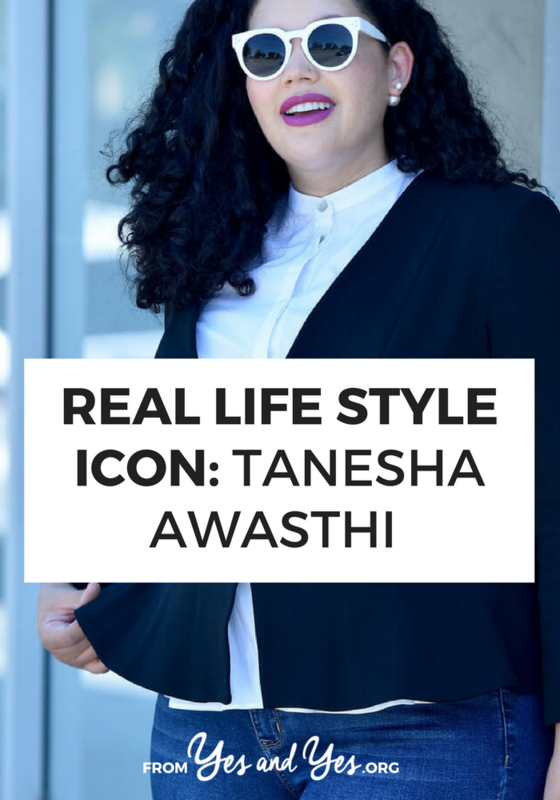 Wow, Tanesha has a dream figure and amazing style. Off to check out her blog! isn't she fabulous?? thanks for sharing this interview! She's absolutely GORGEOUS! What incredible style! Yes! Wow! I wish I had those curves. What a tiny waist and she knows how to flaunt it. Win! Wow. I am so jealous of her amazing curves! Lovely! I have boy hips and an apple shape and I would gladly gain 10 lbs tomorrow if they could just all go to my hips. Love the hourglass figure. WOW!! Her look in the third photo is straight out of a magazine and her curves in the fourth pic are amazing! She's beautiful in every picture but I love this outfit! Thank you so much for introducing us to her!! WOW! Definitely my favorite style icon you've profiled thus far. She is MESMERIZING! That hair! That face! THOSE CURVES! Just beautiful. 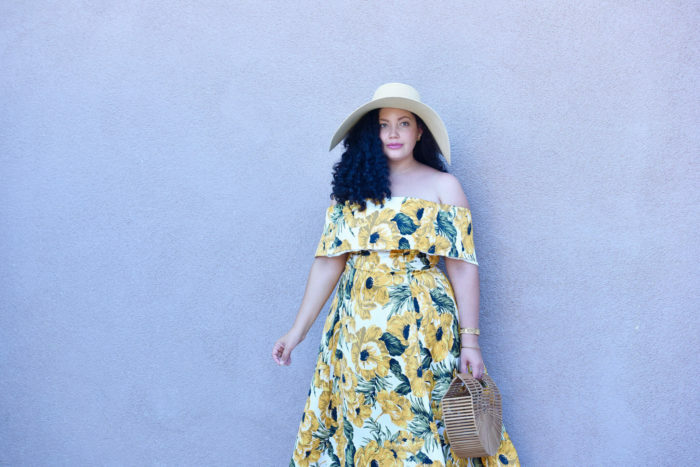 I've been following her blog for a while and am always blown away by her beauty and amazing style! Great post! I love her blog, even though I'm a size 6 I have the exact same body shape and I feel she is way more inspirational than the average, too-popular skinny thighs/flat chest combo fashion blogger. Wow!! First time I’m seeing Tanesha.. my name is Tunisia .. so I had to check her out. She is just beautiful, inspirational and curvaceous. I can’t wait to check her blog. I am 5 “4” at 140 lbs.. my shape is the same, so I am always fighting with myself in the mirror. Thank you!! I can’t wait to see what you suggest! !